Welcome to Yachtco Pre-Sale bounty campaign. 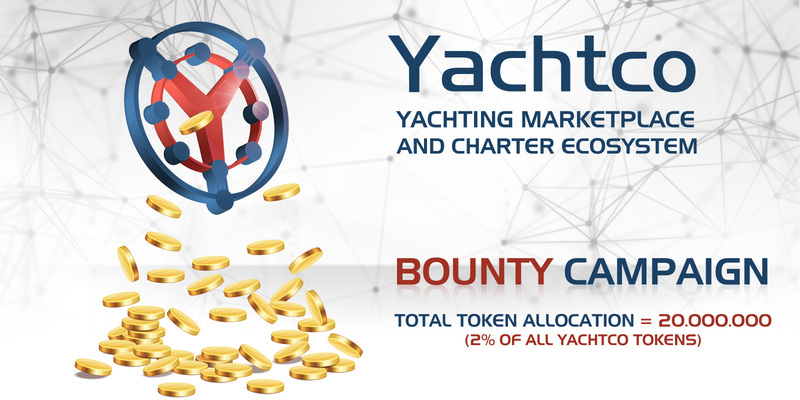 Total bounty pool is 2% of all Yachtco tokens: 20.000.000 Yachtco tokens are allocated for all bounty campaigns. 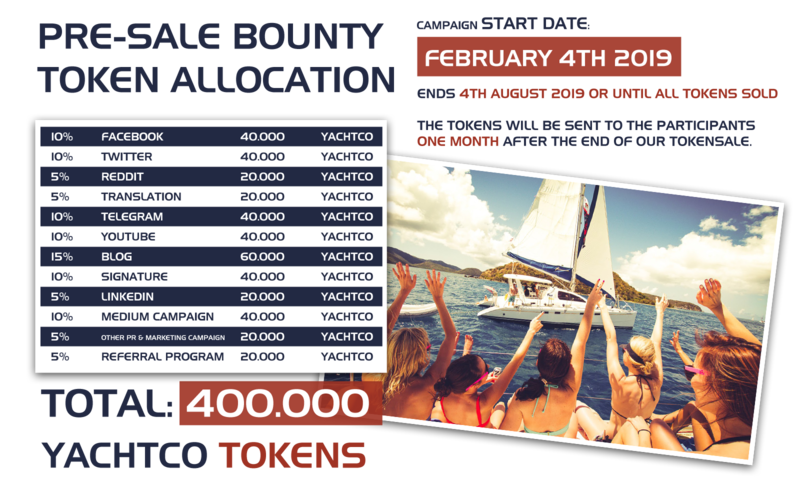 Bounty pool for Pre-Sale: 2% of tokens sold in pre-sale crowdfunding (That is maximum 400.000 Yachtco tokens from maximum 20.000.000 Yachtco tokens that are allocated for pre-sale crowdfunding stage). Pre-Sale bounty will be from 4th February 2019 until all tokens sold or 4th of August, depending on what comes first. To receive the bounty reward you need to get WAVES wallet. You can get WAVES wallet HERE: https://wavesplatform.com/. WAVES wallet instructions can be found HERE: https://docs.wavespl.../as-a-user.html. Tokens will not be locked. You can start trading them on WAVES exchange immediately after you get them (after crowdsale series A). Bounty questions are forbidden on all official channels. These messages will be unanswered and deleted and bounty hunters who ask them will be banned from the campaign. For all bounty questions, use only THIS: https://t.me/yachtco_bounty Telegram group. Being part of this group IS NOT mandatory during the duration of the campaign but you might miss some news if you are not in it. A number of tokens allocated to bounty campaign is connected to collected funds amount. Per example, if the project reaches Pre-sale HardCap, 400.000 Yachtco tokens will be shared between participants. If the project, for example, collects 70% of Pre-sale HardCap, the amount shared will be 280.000 Yachtco tokens. Using multiple accounts, bots or cheating in any way is strictly prohibited, we will check all entries and ban all users who cheat. Banned users will receive no stakes at all. Only Jr Member or higher accounts registered before January 1st, 2019 can participate in this campaign. All other accounts will be rejected. Campaign registration is open until all CROWDFUNDING tokens are sold. KYC is mandatory for all participants.You will need to register on our site and do KYC through our REGISTER FORM: https://yachtco.io/my-account/. You need to have access to your WAVES wallet. You cannot change the registered wallet address after the start of the campaign. We have the right to change the conditions of the bounty campaign. For updates, follow this thread or Telegram bounty group. We will edit the first post when we have updates. Stakes will be calculated on at the end of bounty campaign. Once the limit is reached, we will close the campaign registration. One participant cannot receive more than 1% of the campaign budget. In cases where his stakes amount to more, he will receive only 1% of the total allocation. Members with negative trust CAN NOT participate in the campaign. After the end of the bounty, you will have 1 week for any questions/complaints. You need to register for the campaign through a registration form in order to be accepted. You can find registration forms in separate bounty sections (each campaign has its own registration form). You can see your total stakes HERE. Follow and like our Facebook page: https://www.facebook.com/yachtcoworld. Register through Yachtco Facebook Sign UP Form. You can check your participation confirmation or later stake amount calculation in THIS SPREADSHEET. Share any five posts from official Yachtco Facebook page every week. The maximum share amount per day is only one. The maximum share amount per week is just five. If you decide to make multiple shares each week, make sure you share a different post every time. Same shares will not be counted. Send your reports weekly through Yachtco Facebook Reports Form during the start of next week (Monday or Tuesday). Reports sent later will be ignored and no stakes will be given. You need to have a minimum of 100 real friends. Facebook accounts need to be original. Fake, dead, inactive and bot accounts are not accepted. Accounts called Crypto Connor, Bitcoin Bob or any similar ones with rockets and moons as profile pictures will not be accepted. It NEEDS to be your real profile with real pictures and real friends. Do not fill out the REPORT form multiple times, whoever does will be disqualified. Joining with multiple accounts is not allowed. If we catch you, you will be banned and all stakes will be removed. Follow our Twitter page: https://twitter.com/Yachtcoworld. Register through Yachtco Twitter Sign UP Form. Tweets/retweets must have a link to the Yachtco website https://yachtco.io/ , the hashtag #Yachtco AND at least 2 of these hashtags: #WAVES #Yacht #Cryptocurrency #BTC #charter #marketplace #Crypto #Blockchain #skipper #boat #EUR. YOU MUST INCLUDE THESE IN YOUR tweets/retweets, otherwise, they won’t be counted. The maximum retweet amount per day is only one. The maximum retweet amount per week is just five. If you decide to make multiple retweets each week, make sure you have different retweets every time. Same retweets will not be counted. Send your reports weekly through Yachtco Twitter Reports Form during the start of next week (Monday or Tuesday). Reports sent later will be ignored and no stakes will be given. Maximum number of participants is 2000. You need to have a minimum of 100 real followers. Twitter accounts need to be original. Fake, dead, inactive and bot accounts are not accepted. Accounts called Moon Marcus, Lambo Lord or any similar ones with lambos and yachts as profile pictures will not be accepted. It NEEDS to be your real profile with real pictures and real friends. Follow our Yachtco Reddit page: https://www.reddit.com/user/yachtco 1 stake. Upvote a post 1 stake per upvote. Make a comment 2 stakes per comment. Create a new Yachtco-themed post 3 stakes. Create a new post on a crypto related subReddit speaking about Yachtco 1 stake for every 3 upvotes the post will receive. Maximum Reddit stakes per week 15 stakes. Follow our Reddit page :https://www.reddit.com/user/yachtco. Register through Yachtco Reddit Sign UP Form. The maximum stakes amount per week is 15 stakes. Send your reports weekly through Yachtco Reddit Reports Form during the start of next week (Monday or Tuesday). Reports sent later will be ignored and no stakes will be given. You need to have a minimum of 5 karma to be able to participate. If your karma drops during the campaign, no stakes for that week will be given. You will keep the stakes for the weeks during which karma was 5 or above and you can earn new stakes when your karma increases again. Spam posts will not be rewarded and spammers will be banned from the campaign. For a post to count, it needs to be posted in one of the subreddits, or related to cryptocurrency subreddits: r/bitcoin, r/ethereum, r/ethtrader, r/Tokensalecrypto, r/cryptocurrency. Apply through Yachtco Translation Sign UP Form. Copy of WP is HERE a document for website translation will be added SOON. We will PM selected translators and proofreaders. Translators should update their thread with at least 3 posts per week. You can find interesting content on our social channels. Every good post on ANN thread receives 0.5 stakes. 2.5 additional stakes per week is maximum. You can write more posts but maximum 5 per week will be rewarded. Posts on bounty thread receive no additional stakes but questions need to be answered in order to receive stakes at the end of the campaign. Spam posts are not included. Spammers will be banned from the campaign. Google translate or other similar tools are strictly prohibited. We will assign stakes after proofreading has been done. If we receive reports that the translations are not adequate, we will investigate and remove stakes even after assigning them if necessary so please, do not try to cheat. For web translation/proofreading all languages are welcome! For ANN/Bounty threads all languages from local boards will be accepted (from other languages board not). Apply through Yachtco Telegram Sign UP Form. We will occasionally check if you are a part of the Telegram group. If you are not, you will be excluded from the campaign. Spammers will be banned from Telegram group and will lose all stakes. No swearing or offensive/aggressive communication will be tolerated. You need to be a part of the group until the end of campaign to receive any stakes. Low quality video is not acceptable. The video should be at least 5 minutes long, shorter videos will not be accepted. Accepted languages: English, French, Spanish, Italian, German, Romanian, Portuguese, Turkish, Arab, Japanese, Korean, Indonesian, Hindi, Russian, Polish. The video description must have a link to the official website https://yachtco.io. For proof of ownership, your Forum Profile name and ID must be added to the video description. The quality of the review is based on youtube and socialblade statistics. Do not use fake subscribers and collect fake views, it will be detected. The minimum number of real views (during bounty campaign): 2000. After the work is done, please fill Yachtco Youtube Reports Form. Write an article about Yachtco on your blog or other site. Register through Yachtco Blog Sign UP Form. Low quality articles will not be accepted. The article must be original. You can use official image, logo, graphics on the website, ANN thread, Facebook and twitter. The article must be longer than 500 words, articles with less than 500 words will not be accepted. The article should have a link to the official website: https://www.yachtco.io. Medium, steemit and other free blogging platforms are allowed but only one article on those platforms will be accepted per user. For proof of ownership, you must add your Forum profile name and ID to the footer of your blog posts. After the work is done, please fill Yachtco Blog Reports Form. We will check if the article is original by using antiplagiarism.net and content-watch. Your blog must have real subscribers and views (otherwise, the article will not be accepted). Your article needs to be well formatted and decorated and divided into paragraphs. It is suggested to give a conclusion after the article. The site must have its own audience. Sites will be reviewed by Alexa on a regular basis and we may request statistics. The content should be original. Do not place counters on your website, only official (Google Analytics, Alexa Rank and Yandex Metrika) will be used. Share any five posts from official Yachtco LinkedIn Page every week, If there are no new posts for share, make your own. You must have a minimum of 250 Connections. Your LinkedIn account must not be fake, inactive or a bot account. Only the original LinkedIn accounts will be accepted. You must be an active and regular LinkedIn user, and must be sharing and liking Yachtco official posts and updates once a week. Account must be open as a Public Profile and all Posts shared need to be public as well. Multiple accounts are not allowed. Those found using such multi accounts will be disqualified and blacklisted from any and all future campaigns. Bounty Manager and the Team reserve their right to delete fake profiles, posts, and comments of low quality and make changes to the terms of Bounty campaign. After the work is done, please fill Yachtco LinkedIn Reports Form. Earn Tokens as a Reward for your PR & Marketing creative ideas. In case you have any proposals different from those mentioned above, please fill the form and contact Yachtco team member on the telegram to discuss your proposal and agree on the reward. Earn Tokens as a Reward for introducing potential investors buyer of our Yachtco tokens. You can introduce the potential contributors (buyers of our Yachtco tokens ). You will get 5% of the amount of yachtco bought by the people you had introduced. After your registration on Yachtco website , you will get Contributor code by email. You should send this code to your contributors.